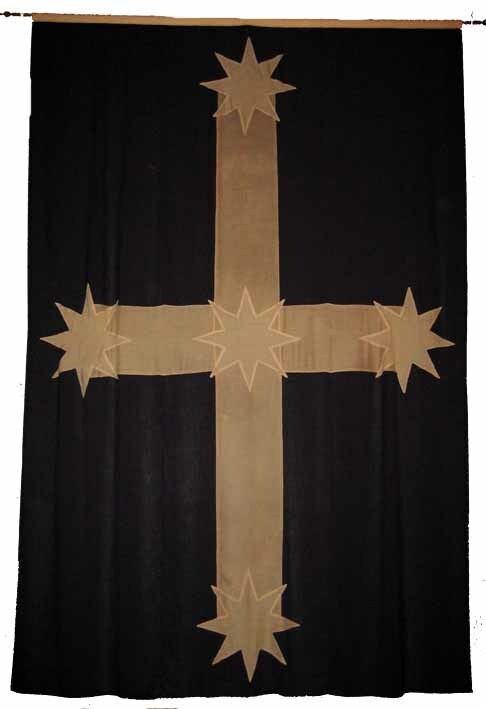 The flag of the Ballarat Reform League, the Southern Cross, now more commonly known as the Eureka flag, was first flown at a Monster Meeting of around 12,000 people held on 29th November 1854 at Bakery Hill. The meeting was called to hear the results of the Ballarat Reform League's deputation to Governor Charles Hotham. The anger of the meeting when they heard of Governor Hotham's dismissal of their Charter led to a call to burn mining licences. A definitive answer to who made the Eureka Flag, is not known. The flag is made of blue wool and white cotton. 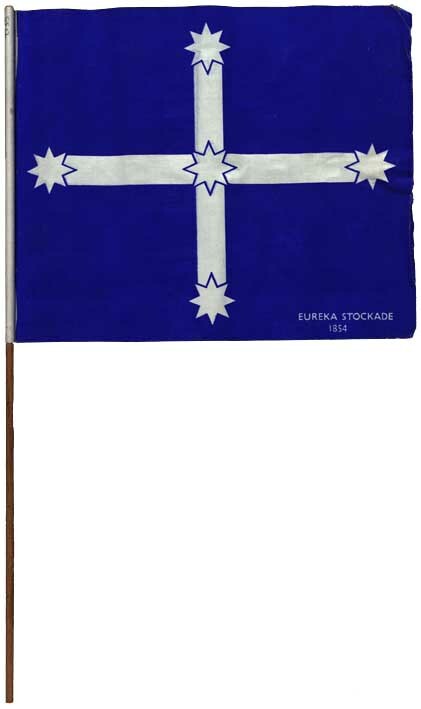 Although evidence suggests the flag held by the Art Gallery of Ballarat, and Displayed at the Museum of Australian Democracy at Eureka, is the flag flown at the Eureka Stockade, there has been conjecture over the years. I saw the flag (at the gallery), and scrutinised it, and came to the conclusion that possibly it is the very identical flag displayed at the 'Slabaide' over forty years ago, and in my opinion it may not be. I expected to sees a little tint of red colour on the face; but through the ;apse of time this colour might have disappeared. Neither is the blue colour very distinct, which was so in the original.I am even now sure nearly anyone might have concocted the banner, and, moreover,my impression is that the flag was more artistic. Anyhow, we might do worse than reject it; it will be something for posterity to worship. In the Art Gallery at Ballarat, in a locked drawer, in a locked room, put away in the dark with a handful of mothballs, is an old torn and tattered flag. Few people know it is there; hardly anyone sees it from year to year. And yet recent research carried out by the Australian Communist Party indicates that this flag is the original flag that flew on the masthead at the Eureka Stockade — a symbol of Australian democracy in that historic pitched battle when men shed their blood for freedom. A watercolor painting and a sketch by Huyghue in the Ballarat Art Gallery also indicate (though not very clearly) a plain white cross as in the King flag. These facts show that the Raffaello design was not accepted in 1870-71 by the men who had been at Eureka. Another argument against it is that the Raffaello flag would be far more difficult to make than one with a plain cross; it is unlikely that whoever made the flag would choose such a design. Finally, there is no flag in existence resembling the Raffaello design. The King Flag But where did the King flag come from? Mr. John King offered it to the Melbourne Public Library in 1871. 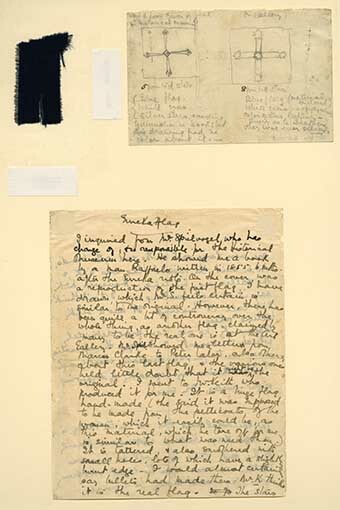 The novelist Marcus Clarke was Librarian, and he sent the flag to Peter Lalor with a covering letter which is in the Ballarat Historical Museum. Alexander Sutherland's book, Victoria and its Metropolis, published in 1888, describes John King as a native of Antrim, Ireland, who had come to Ballarat as a digger, and then joined the police. "He volunteered," writes Sutherland, "and successfully accomplished the task of climbing the flagpole and tearing from its masthead the ensign of the miners, a large blue flag bearing a white Southern Cross, the emblem being still retained by the family. As the trooper who claimed to have pulled down the flag, John King would be the most likely person to have possession of it afterwards. Withers, in his History of Ballarat, published in 1870, writes in the Appendix that "the flag was hauled down by trooper, or policeman, John King. . . King gave the flag, or what was left of it to Inspector P. H. Smith, who was also a Mayo man, Smith died in Melbourne." Withers, in 1896, quotes a Mr. Archibald as saying Smith returned the flag to the Kingr familv. Flag Secured In 1895 Mr. James Oddie, President of the Ballarat Fine Art Association and Art Gallery, realised that the flag (then in the possession of Mrs. James King) was worth securing. The secretary of the Association wrote to Mrs. King, and she replied: "I have much pleasure in offering loan of flag to the above association on condition that I may get it at any time I specify, or on demand by myself or son, Arthur King." Why the Melbourne Public Library refused to buy the flag is not known. One reason seems to be that Lalor later became doubtful about it, writing to Mr. Wilson: "I believe it to be the true flag although it does not quite agree with the details given in your letter." 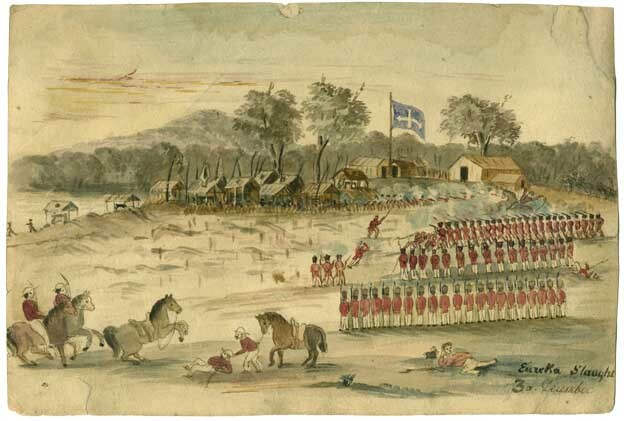 Withers later stated that these details were extracts from the first edition of Withers' History of Ballarat, which Withers himself admitted were based on incomplete knowledge of the flag. Melbourne Labor veteran George Dunstan has written to me pointing out that the conservative trustees would probably be prejudiced against a revolutionary flag. By May, 1945, research had pointed to the authenticity of the King flag, but some final acid test was needed. In search of such a test I visited Ballarat, and found it — thanks to the work of Mr. Spielvogel — in the middle of an article written by Ballarat historian Withers dated 18/4/'96, and preserved (as a newscutting) in the Historical Museum. Withers' article is extremely interesting. When he began to interrogate old Ballarat diggers who had seen the Eureka flag, he found that "some thought it was blue, some red. some white, one actually had seen a black flag. Some said that the flag bore on it a cross (ecclesiastical), some said it did not, but only the 'Southern Cross.'" But — and here we come to the acid test — Colonel Rede had sent Withers a fragment of the Eureka flag, given to Rede's mother-inlaw, Mrs. Clendinning, by Dr. Carr, who was doing medical duties for the military at Eureka. (This is the fragment referred to earlier in this article.) The Acid Test "This fragment," writes Withers, "and a fragment of the King flag I submitted to the expert inspection of Mr. Grainger, the manager of the Sunnyside Woollen Mills here, and he thought the two similar, but wished to have a larger fragment for comparison, and Colonel Rede kindly sent me all that Mrs. Clendinning had, a piece two or three inches square. "Mr. Grainger was so courteous as to meet Mr. Oddie and me at the Art Gallery, when he minutely compared the Dr. Carr fragment with the King flag, and said the fragment was a part of the flag. That is to say, it was identical in material and construction, the warp in both flag and fragment being; cotton and the weft mohair. Withers draws no conclusions, leaving it to his readers to act as a jury, but surely this is as severe a test as any flag could be asked to pass. In view of doubts still raised by some people, however. I suggest that the flag be submitted to a committee of scientists and textile experts for close examination — certain stains and marks on the material, and its manner of construction, might help to establish its authenticity or otherwise. Mr. Keith, curator of the Ballarat Art Gallery, tells me that a ballistics expert from the police examined the holes in the flag and confirmed that they are gunshot holes. According to the Sydney Sun of 5/5/41, by the way, the files of the Ballarat Times indicate that the flag was made by two women from an original drawing by a digger named Ross, who was killed near the flagpole. One Eureka veteran interviewed by Withers said he remembered a Digger having a light blue flag with some stars but no cross on it; this suggests that in addition to the main Eureka flag there may have been one of different design in the personal possession of one of the diggers. ... One final interesting point is that at the trials the defending barrister declared that the Eureka flag "was the same kind of flag, perhaps the very same flag, which the members of the Anti-Transportation League hoisted when first they visited this colony from Van Diemen's Land." Thomas Dunbabin in the Sydney Sun of 14/4/35 also writes that in 1851 a vessel entered Launceston flying the flag of the Australasian League, the white stars of the Southern Cross on a blue ground. So that the Southern Cross is an emblem not merely of Eureka, but of all Australia's democratic struggles. The Southern Cross on the Australian flag today, the flag that defied the fascists at Tobruk and that floats above our Diggers in the islands to-day — this, too, is the same Southern Cross that flew at Eureka, Diggers giving their lives for liberty beneath the emblem of the Southern Cross—at Ballarat in 1854 or in New Guinea jungles 90 years later—it is all the same fight, the same proud Australian tradition. In December 1973 Prime Minister Gough Whitlam arrived in Ballarat to unveil the restored Eureka Flag, at which time he made a landmark speech identifying Eureka with out quest for national identity. 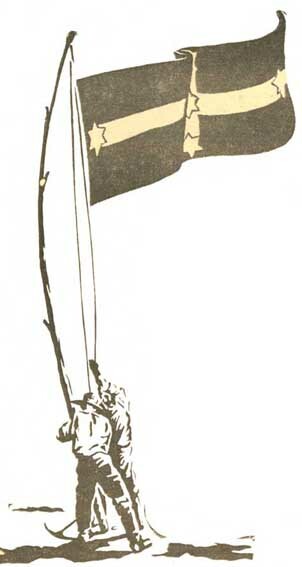 The work on the flag had been undertaken by Val D'Angri. 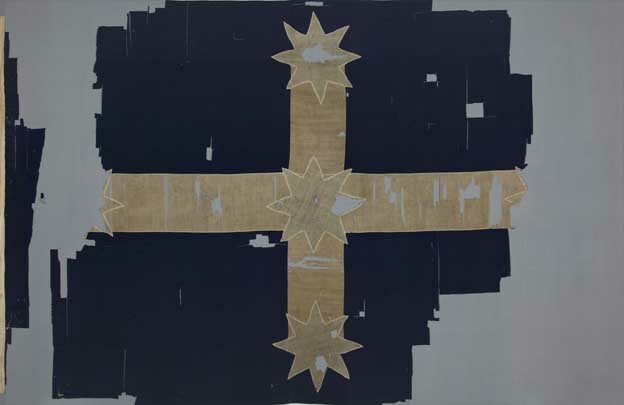 In 2011 the Eureka Flag underwent an extensive repair and restoration undertaken by Arlab Australia, one of Australia's leading textile conservation specialists. The City of Ballarat received a permit from heritage Victoria to undertake the work, and commissioned a full assessment of the condition of the flag. The report from Artlab described the Eureka Flag as 'arguably the most important historical textile in Australia'. The key conservation work involved replacement of the old backing cloth with state of the art materials that are less prone to deterioration, replacement of the timber backing board and the construction of a new, purpose-built display case. After conservation was completed the Eureka Flag was exhibited at the Museum of Australian Democracy at Eureka (MADE) in a purpose built, low light, temperature controlled case. Trooper John King’s family loaned the flag to the Ballarat Fine Art Gallery (now the Art Gallery of Ballarat) in 1895, at the instigation of Gallery President, James Oddie.In 2001 descendants of John King formally donated the flag to the Gallery. In 2013 the Art Gallery of Ballarat agreed to loan the Eureka Flag to the Museum of Australian Democracy at Eureka (M.A.D.E.). The fragment is associated with Evelyn Healy of Sydney, whose mother was sent her the fragment. The fragment had been in dispute with Lex McClintock who claimed the fragment was his fathers. Lex McClintock tried to sell the fragment through Christie's auction house from between $10,000 and $20,000 in August 1996, but Evelyn Healy successfully obtained an injunction against the sale disputing ownership. Final paperwork in a confidential settlement was concluded. 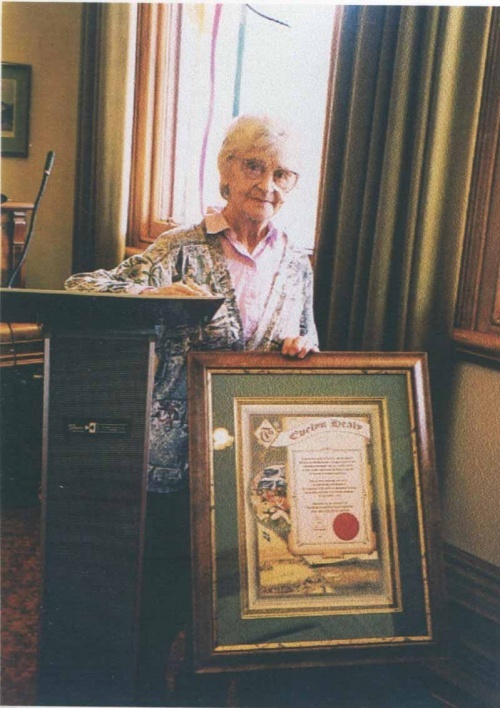 Evelyn Healy (nee Shaw) was born in Ballarat in 1912 and played a vital role in rescuing the Eureka Flag from obscutirty through her involvement with the Communist Party. The parety wanted to make a replica for its 1938 May Day Parade in Melbounre, but the party believed the national icon was lost. Evelyn Healy, believing the flag was in Ballarat, wrote to her mother Myrtle Shaw, who spoke with the Ballarat Fine Art Gallery's custodian William Keith. Mr Keith gave Myrtle Shaw a small fragment of the flag which she sent to her daughter was a couple of rough sketches and a description. It was shown to her party comrade Rem McClintock. Later Evelyn Healy tried to retieve the letter and flag, Initially she was told it was still needed, then she was told it was lost. On 3 December 2013, Adrian Millane presented his family's Eureka Flag Fragment to be displayed on loan at M.A.D.E. This coincided with the 159th Anniversary of Eureka. During the whole of the morning several men were busily employed in erecting a stage and planting the flagstaff. This is a splendid pole of about 80 feet and straight as an arrow. This work being completed about 11 o’clock, the Southern Cross was hoisted, and its maiden appearance was a fascinating object to behold. There is no flag in Europe, or in the civilised world, half so beautiful and Bakery Hill as being the first place where the Australian ensign was first hoisted, will be recorded in the deathless and indelible pages of history. The flag is silk, blue ground with a large silver cross; no device or arms, but all exceedingly chaste and natural. Nearly 150 years ago, a defining moment in Australia's working class history occurred ¬ the Eureka Rebellion. Today, the Eureka spirit lives on, inspiring a sense of a 'fair go' in all Australian workers. 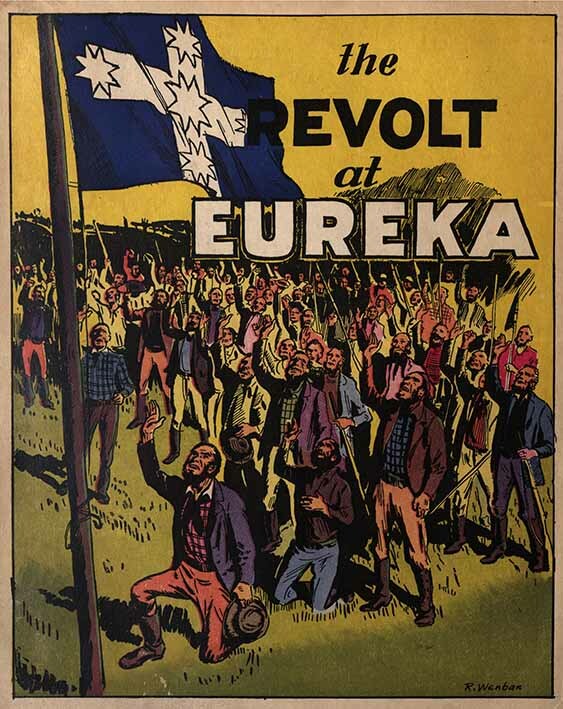 'The Eureka Rebellion goes to the core of what trade unionism is about ¬ the right to be heard; the right to oppose tyranny and oppression; to put all on the line and stand together for what you believe in', said Mr Brian Boyd, Chair of the VTHC's Eureka Rebellion 150th Anniversary Committee. 'The union movement has no monopoly ownership of the Eureka flag. It is the people's flag, but unionists closely identify with its history and what it represents,' added Mr Boyd. 'We support the Bracks Labour government's initiative and announcement tomorrow to put forward an official program to celebrate the 150th Anniversary of the Eureka Stockade,' concluded Mr Boyd. 'A Night Under the Southern Cross' at the Eureka Compound. 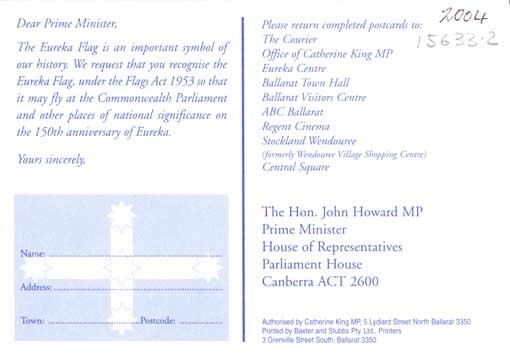 Request for Recognition of the Eureka Flag under the Flags Act 1953, 2004. Federation University Historical Collection. ↑ http://www.ballaratreformleague.org.au/eurekaflag.htm, downloaded 08 March 2013. ↑ Sydney TRibune, 17 July 1945. ↑ Association [magazine of the Ballarat Fine Art Gallery Association], Winter 2011. ↑ My Ballarat, September 2010. ↑ Business News, Issue 218, May 2013. ↑ http://www.made.org/Explore/EurekaFlag.aspx, accessed 10 August 2913. ↑ Ballarat Courier, 09 April 1996. ↑ Ballarat Times, 30 November 1854.